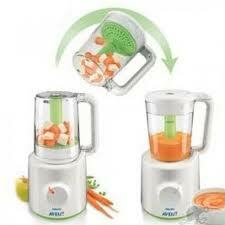 Meet my new favourite gadget: the Philips Avent Combined Steamer and Blender. Never one to follow strict rules about anything, we do a combination of baby led weaning and purées. The steamer-blender is great for that. I buy my organic veg from work on a Friday. I then wash and peel them and cut them into finger shaped pieces (makes holding them easier for baby) and pop them in the steamer. The water measuring container is graded in minutes, so I fill up to 10 or 15 min and pour it into the reservoir. The machine automatically switches off and beeps when ready – which is great because I am invariably busy with homework or something else and forget that I’ve put the steamer on. When everything is steamed, I take out a few bits for baby to chew on and then turn the jug over and blend up the rest. I store the purées in my Via cups. I love that it is relatively small and steams things very quickly. So when she’s eating more, we can steam her portions every day. The whole unit is very easy to use and easy to clean. It comes with a lovely little recipe book with some interesting combinations if you need some inspiration. We also got some utensils and bowls from Avent to try out. I love the travel feeding set which is basically a nice size lunch box consisting of a feeding bowl and two lidded containers. 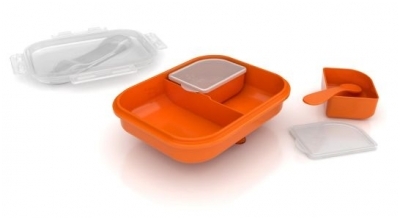 The lid has a built in compartment for a feeding spoon (included in the set) and there is a suction mat that prevents the bowl from being flung around. We put purées in the two little containers and chunks of food in the bigger part. Avent also does a range of bowls and spoons with gorgeous designs on them. The pictures are designed by a child psychologist with an educational storytelling design on them. All of them are BPA-free, the bowls have non-slip bottoms and are very robust.